Winter rates (01.11.2016 - 07.04.2017) are valid for any bookings with duration up to 13 nights. For 14 nights and longer you get A DISCOUNT OF EUR 10,-/NIGHT. For 21 nights and longer you get A DISCOUNT OF EUR 20,-/NIGHT. We rent out an unique ground floor apartment with panoramic seaviews. The property is situated on the very first beach line in luxury community with 4 pools. 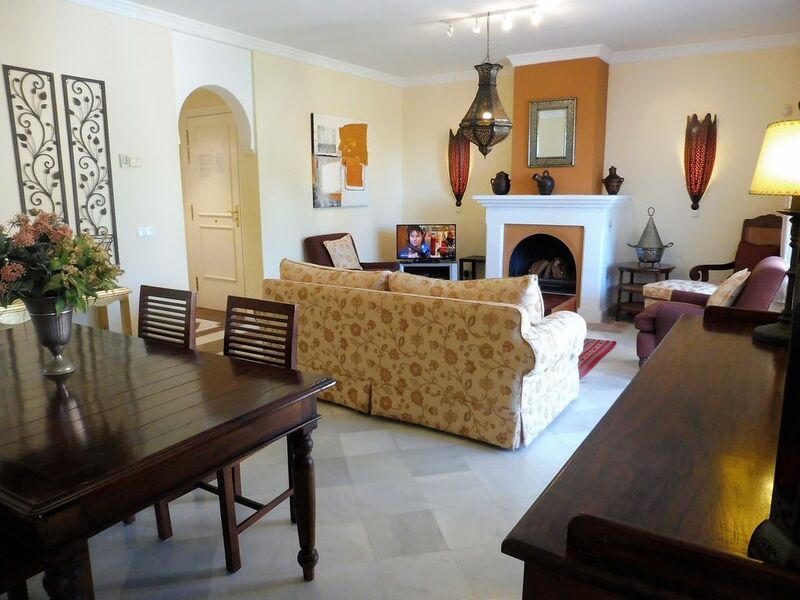 The property has been furnished very tastefully and to high standards to a Moorish style. The spacious living room has a fireplace and dining table to seat up to 6 people. From living room you have direct access to the large covered terrace with lounge furniture, which overlooks the private garden infornt and 2 community pools. One of this pools is even heated! From the sunny terrace you enjoy beautifuly seaviews. Both bedrooms have spacious built-in wardrobes and en-suite-bathrooms with windows and under floor heating. The master bedroom has direct acces to the covered terrace and offers directly seaviews. Here you will find 2 singlebeds put togehter to a king size bed. In the second bedroom there are also 2 single beds. The apartment offers spacious wooden kitchen, air conditioning, WIFI-internet and underground parking space. need to know about San Luis de Sabinillas:: San Luis de Sabinillas is the village next door. This is a typical andalusian village situated right on the coast with charming spanish character and large paseo maritimo with several shops, bars and restaurants. The village offers further numerious shops, large supermarkets, banks, bakery, pharmacy, post ect. Sabinillas is much more Spanish, than the near marina port of Marina de la Duquesa with its numerios bars and restaurants. Here you will find also internetcafes, business centers, minimarket, fitness club, dry cleaning ect. Sundays (when the weather is good) in Sabinillas is one of the largest markets - must be seen! need to know about Estepona:: Estepona is a small charming city on the Costa del Sol. Situated between Marbella and Gibraltar, not far away from the marina town of Puerto Banus. Estepona has saved successful its character of a typical Andalusian village in spite of a growing tourism. In the centre you will find the Plaza Las Flores, one charming constructed meeting point. In his neighbourhood you will find several bars, coffees, tapas bars and shops along the pedestrian area or the old city centre. Mentionable is the bullfighting arena of Estepona, drafted on plans of Salvador Dali and has the adequate charisma. In Estepona you will find a multiplicity of restaurants, small typical tapas bars or even exclusive gastronomy. On Wednesdays and Sundays you can visit the market place in Estepona. You can stroll along the very tastefully decorated promenade with a lot of plants and trees up to the marina port of Estepona. further golf informations: Only 5 minutes car drive away are 3 golf courses (18 holes): 1. The new Dona Julia Golf Resort (1 km) 2. 'La Duguesa Golf' Urbanisation El Hacho, Manilva Tel:0034 952 890 425. Hilly course with a good test for even the top pros. 18 holes. Par 72. Competition length: 6,054 metres. Designer: Robert Trent Jones. 3. 'Estepona Golf' CN 340 (coastal road), km. 150, Estepona Tel: 0034 952 113 081 Fax: 0034 952 113 080. One of the 'new waves' of Coast courses. Breathtaking views of mountains surrounded by natural green fields studded with impressive trees and shrubbery. 18 holes. Par 72. Competition length: 5,842 metres. Designer: José Luis López. We are working together with a Golf travel agency, that can provide you discounted greenfees on 32 selected golf courses on the Costa del Sol. Please contact us for further information. Each of the bathrooms is en-suite and offers underfloorheating for comfortable temerature. In every bathroom there are also windows. wireless WiFI- highspeed internet access available on extra costs provided by communal Hotspot. Very tastefully and comfortable furnishings in a mixture of modern and moorish style with powerfull collors. Numerious decoration pieces, mirrors, lamps and pictures create an unforgetable ambience. I have loved my stay. To do business with the owner is trouble free. The apartment is large, clean, quiet and very secure. Easy to find when you arrive. You need a car to get there. Directly, in front of the beach surround with beautiful garden. Then it is well located to get everything you might need. It is a good place to stay to visit the country. The TV program on satellite is only in german. Anyway I was not there to watch TV. The contact with the person responsible was easy, polite and on time. I strongly recommended this apartment. Ein tolles apartment - genauso schoen wie auf den Bildern! Der Vermieter sehr hilfsbereit und freundlich, die Schluesseluebergabe und vor Ort Betreuung durch Alberto ausgezeichnet. Wir waren 2 Familien mit jeweis 2 Kindern und hatten 2 apartments nebeneinander (Marakech 4 und 16). Die Kinder konnten hin und her laufen wie sie wollten. Die gesamte anlage sehr sauber und gut betreut. Es war sehr ruhig, immer Platz am Pool, am Meer sowieso. Die Kinder haben hunderte Muscheln gesammelt... Die Nahversorgung super - 2 grosse Supermaerkte ganz in der Naehe. Unsere ausfluege nach Gibraltar (40km) und nach Ronda sehr nett und entspannt. Wir koennen sowohl die Anlage als auch den Vermieter zu 100% weiterempfehlen und kommen sicher wieder! Diese Bewertung gilt fuer beide Apartments! La Perla de Marakech 4 ist eine EG-Wohnung in einer kleinen Anlage direkt an der Küste. Weitab von jeglicher Hochhausbebauung und fern vom Trubel. Trotzdem ist die Anlage sehr gut angebunden. Nach Estepona sind es gerade mal 9 km. Auch wenn auf der Nordseite der Anlage die Fernstraße N 340 verläuft, so bleiben Sie fast ungestört (Manche Motorräder wollen halt gehört werden). Die Zufahrt erfolgt über eine ruhige palmengesäumte Allee /Stichstraße. Das Gelände ist üppig begrünt und gut eingewachsen, alles sehr gepflegt. 15 m vor der Terrasse der Wohnung liegt einer der Pools der Anlage, leider ist dieser nicht beheizt, doch schon weitere 15 m der nächste etwas kleinere beheizte (4 Grad höhere Wassertemperatur wäre mir im März etwas lieber, aber ich mag es auch gerne richtig warm). Die pools sind zwar nicht riesig, reichen u.E. jedoch für diesen Teil völlig aus, zumal unweit weitere Becken bei den dahinter liegenden Häusern vorhanden sind. Sonnenliegen waren ausreichend vorhanden; leider lassen sich diese nicht völlig flach stellen. Vom Meer ist die geschützte und eingezäunte Anlage nur durch eine kleine ruhige Strandpromenade getrennt. In jede Richtung erreichen Sie bald ein Strandrestaurant mit vernünftigem Angebot. Die Wohnung selbst ist nett eingerichtet und hat vernünftigen Komfort. Sitzgelegenheiten sind ausreichend vorhanden; die Küche durchdacht. Leider ist der vorhandene Fernseher etwas antiquiert und klein. Die Verwaltung teilte mir jedoch mit, dass an einen Austausch gedacht wird. Die Betten in den beiden Schlafzimmern sind für einen 2m-Mann wie mich etwas kurz. Die Klimaanlage dient auch als Heizung und hat uns im März mit kalten Nächsten ordentlich gewärmt. Zur Wohnung gehört ein TG-Platz im gleichen Haus, der mit Fahrstuhl erreicht wird. Gepäck und Einkäufe muss somit nicht geschleppt werden. Golfspieler finden "fast vor der Haustüre" Ihren Platz und Ausflüge ins Gebirge, nach Gibraltar oder Marbella sind fast "Minutensache". Bereits nun zum wiederholten Male habe wir die wunderschöne Wohnung geniessen dürfen. Lage und Ausstattung der Wohnung übertreffen die Angaben im Online-Inserat: es ist einfach noch viel schöner als im Prospekt! Zustand und Ausstattung waren wie immer perfekt, alles bestens und zu unserer Zufriedenheit. Besonders hervorzuheben ist der Service des Vermieters, der nicht nur im Vorfeld sondern auch während unseres Aufenhtaltes für all unsere Wünsche stets ansprechbar war und unverzüglich geholfen hat. Auch das ist ein ganz besonderes PLUS dieser Wohnung, auf das wir uns nun schon all die Jahre verlassen konnten. Würden Sie die Wohnung weiterempfehlen? Das haben wir tatsächlich bereits mehrfach getan und ebenfalls nur positives Feedback erhalten. Also alles in allem: eine 1+ oder aber: unbedingt empfehlenswert!!! Die gesamte Anlage ist zu empfehlen ! Wir haben unseren Weihnachtsurlaub in der Anlage verbracht, die auch in dieser Jahreszeit noch regelmäßig gepflegt wurde. Die Wohnung (Marakech 4) ist geräumig, sauber und gemütlich – wir haben uns sehr wohl gefühlt. Zu den beiden Pools sind es nur wenige Schritte und zum Meer, das man vom Haus aus sehen kann, sind es auch nur einige Meter. Mit dem Auto sind die Einkaufsmöglichkeiten gut zu erreichen. Das Einkaufszentrum „La Cañada“ ist einen Besuch wert. Auch die Abwicklung war reibungslos und unkompliziert und der Kontakt zum Vermieter stets freundlich und hilfsbereit. Rund herum ein schöner Urlaub in einer gepflegten Anlage und einer gemütlichen Wohnung. Wir kommen sicherlich einmal wieder ! As you travel west from the sophisticated resort of Marbella, passing the beautiful fishing port of Estepona in the direction of Sotogrande, the coastline begins to dramatically change. Gone are the tourist hotels and sprawling beachside developments. Instead, natural beaches and unspoilt countryside flank the roadside and the traveller begins to feel the pull of nature and the past. Below the ancient pueblo of Casares, which is seemingly untroubled by the pressures and demands of modern life, lies La Perla de La Bahia. Golf: The region around Marbella is well known for its abundance of golf courses! Thats the reason why the Costa del Sol between Marbella and Estepona is named Costa del Golf. Every Golfer will find the convenient place for his game under 100 offered golf courses! No matter of being a Golfmaster or a greenhorn beginner, the region offers to any taste or severity diversified opportunities. In our neighbourhood or a short car drive away you will find following golf courses: 1. Dona Julia Golf Resort 2. Estepona Golf 3. La Duguesa 4. Guadalmina Noth & Guadalmina South 5. Franhouse Golf 6. Montemayor 7. El Paraiso 8. Atalaya 9. Los Aqueros 10. La Quinta 11. Los Naranjos 12. Las Brisas 13. Aloha 14. Dama de Noche 15. Valderrama 16. Sotogrande 17. San Roque We cooperate with a golf agency that offers you discounted greenfees on 41 golf courses. Please contact us for further details.